An Apartment Hotel (also ApartHotel, Apart Hotel and Apart-Hotel) is a type of accommodation; described as "a serviced apartment complex that uses a hotel style booking system" A serviced apartment is a type of furnished, self-contained apartment designed for short-term stays, which provides amenities for daily use. Serviced apartments that are less expensive than most hotel rooms and are geared toward priced concise international traveler, who desires the ability to cook, have the extra spaces and living an apartment lifestyle while traveling internationally. A secure and clean enclosed, appendix in the heart of Sosua. Only few minutes walk to a newly formed beach and only 5 minute walk to the main Sosua Bay Beach. We are the last and seventh of 6 other properties located on a private Cul-de-Sac, its like absolute peace in the city center and ONLY up hill one small city block to ALL OF THE ACTION of Sosua. A car rental is NOT required, however as we are happy to supply the budget traveler a discounted car rental from our fleet of economy cars. Everything is within walking distance; The bank, Discos, Bar, Food, Drinks and Shops are all right there! 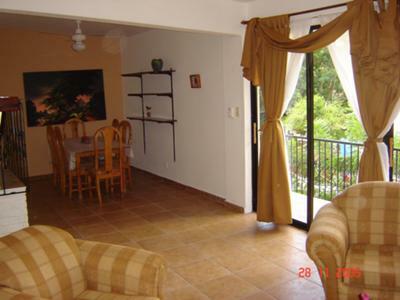 Perla de Sosua consist of Studios, 1 Bedrooms and 2 Bedrooms Apartments. Most with cooking facilities or kitchens, Some with full sized living rooms and separate dining rooms and all air conditioned bedrooms, safes, ceiling fans. Linen, and cleaning services provided, pool and community terrace on premises. This apartment seems like it has all the features that most tourists are looking for when planning a vacation abroad... The quality services and amazing staff will help them live a decent life, without fearing that their health condition may get worse and they would be all alone. Wow, the rental price lists of this apartment are very reasonable. I love the inside photos of this apartment. The best thing I loved about these apartment is the interior and he luxury look. Great hotel to spend the vacation.